In recent years, helicopters have undergone radical changes to remain up-to-date with safety regulations, longevity, quality improvements, and advanced military application. Aircraft manufacturers, including Sikorsky/Lockheed Martin, based in Stratford Connecticut, and Boeing, headquartered in Chicago Illinois, are head-to-head in aircraft improvements, thus raising the bar for future helicopter design and their compliance with both commercial and military settings. Now, companies and individuals engaging in research and development regarding the aircraft industry are eligible for federal and state R&D tax credits. An increase in the number of helicopter-related accidents has resulted in not only serious injury and civilian fatalities but also a call for aircraft improvements. Although overall civil helicopter accidents in the United States decreased 25% since 2007, fatalities remained annually around 4 dozen. Recommendations were made by the National Transportation Safety Board (NTSB) and Federal Aviation Administration (FAA) to improve helicopters, namely in upgrading fuel systems. After all, many of the casualties resulted from fuel system explosiveness after a crash. It is anticipated that $500 million or more in investments will account for amending the fuel system safety gap in existing helicopters. Truth Data Insights, a Texas-based flight monitoring company, and Toll Rescue Helicopter Service, an Australian company, are studying Toll’s fleet of Leonardo AW139 helicopters. Flight data monitoring services offered through Truth Data Insights permits Toll to identify operational risks associated with human error. Then, after a mission, the flight data is transmitted to cloud-based data storage to be processed and analyzed. The general manager of Toll Helicopters explained the benefits of this process: “To have dynamic data captured and used in near real-time ultimately leads to safer operations with this system, representing world’s best practice for lead data and proactive risk and safety management.” Analysis from the first four months of implementation has resulted in substantial improvements to Toll’s helicopters. Surprisingly, advances in civil helicopters are harder to achieve since those companies argue over the cost and necessity of such improvements. On the other hand, companies engaging in military efforts are quickly jumping on the bandwagon, competing to make the most effective aircraft enhancements that will support and sustain military needs over longer periods of time. This American aerospace manufacturer is headquartered in Mesa, Arizona. It produces helicopters for commercial and military use, namely regarding the military, law enforcement, utility, EMS, and VIP. Some of its fleets include the Korean Armed Forces, U.S. Special Operations, Japanese Self Defense Forces, the Italian government, and many more. For the past two years, the company experienced improved ratings of 40% or more across all measured helicopter customer support categories. Director Randall Schaffer said that since 2015, “we worked to refine [our] focus, putting significant resources into ensuring the right people and the right processes were in place to guarantee rapid response to our customer needs.” The company has been making improvements geared around the voice of the customer. They strive to deliver excellence in every area. As a result, they make some of the best helicopters for business trips, government official usage, and connecting to resorts or yacht landing pads. During the March 2017 HAI Heli-Expo in Dallas Texas, integration and testing efforts for the company’s Block 1 glass cockpit upgrade were announced. It was determined that it is a “safe, affordable solution that reduces pilot workload and improves overall operational efficiency in even the most demanding environments.” This upgrade would appear in the MD 600N airframes, single-engine helicopters. The MD 600N is applicable to law enforcement, utility, EMS, and VIP missions. Furthermore, based off customer orders and comments, additional modifications will be made to MDHI’s other single-engine aircrafts, including the MD 500E (for law enforcement, utility, and VIP) and MD 520N (for law enforcement, utility, and VIP), by mid-2018. In fact, MDHI incorporated a strong customer voice in the proof of concept phase of its new aircraft, MD 6XX Concept helicopter. The MD 6XX will be a scout attack helicopter with additional certification in civilian use for law enforcement and EMS missions. Its traditional four-bladed tail rotor and extended composite boom will make it potentially deliver 40% more anti-torque power coupled with a reduced noise signature. The blades employed ought to improve performance by 10%. As with most new aircraft, the cockpit will incorporate an avionics system that reduces pilot workload and offers digital three-axis auto-piloting while complying with instrument flight rules. Other technology will incorporate LIDAR sensors and camera technology which to advance new features like deploying and retrieving drones. Business affiliations with companies in the automobile industry are instigating a common move towards autonomous vehicles, whether they are in the air or on the roads. This joint effort is greatly advancing the growth of automation in cars and aircrafts. Airbus, a European multinational corporation headquartered in Toulouse, France, found that their contributions to the helicopter industry will not improve as much as they anticipated but that growth will begin in 2019 and continue through 2024. In 10 years, they expect to double their fleet size, and in 20 years, to triple. In the meantime, Airbus seeks improving quality in its existing civil helicopters. By improving quality, Airbus should separate itself from market competitors, which would undoubtedly improve resale value while catering to customer needs and demands. For example, in 2015, Airbus released Bluecopts, which has lower noise levels, burns less fuel, and is more efficient to operate. The company is proud to say that they “met [their] goals of decreasing fuel consumption by as much as 40%, significantly reducing CO2 emissions, and lowering noise to approximately 10 decibel effective perceived noise below ICAO noise certification limits, while raising the maximum payload and the passenger comfort.” There is also an eco-mode when in flight that further enhances performance and shuts off one of the engines. To keep up with such advancements, other companies ought to pursue similar endeavors. Finally, Airbus released the Helionix digital avionics fixed-base trainer to automate a cockpit’s flight control system. The system incorporates redundancy so that in the event of malfunctioning, the system undergoes an automatic reconfiguration without requiring pilot intervention. It should be installed in all Airbus helicopters over the next several years. As of now, it is certified for the EC175 and EC145 T2 helicopters. Military helicopters are rapidly developing as competition amongst leading aircraft companies intensifies. These changes are seen in both the U.S. military and around the world. The military is seeking to create a fleet of aircraft that are faster, fly greater distances without refueling, operate in all weather conditions, and maintain high speeds and hovering capabilities. This effort, known as the Joint Multi-Role Technology Demonstrator, intends to have a new fleet released by 2030. The Future Vertical Lift program will be incorporated into the new fleet as it is currently being tested by Bell, Sikorsky, and Boeing. FVL is considered a “high priority. We have identified capability gaps. We need technologies and designs that are different than what the current fleet has,” as explained by the project manager of the FVL effort. Many unique features are brought into the conceptual designs for this future fleet. For example, “fly-by-wire” technology will help a helicopter autonomously fly along a course provided the pilot is somehow incapacitated. Cognitive decision-aiding technologies will “track, prioritize, organize, and deliver incoming on- and off-board sensory information by optimizing visual, 3D audio and tactile informational cues.” As a result, the pilot should not be overburdened with an onslaught of new information, which should help him make cognitive decisions that do not negatively impact the success of the mission. Further advancements are proposed to integrate sensors with a countermeasure technology system. This would detect risks over a wider range and notify the pilot of potential oncoming threats. Some of this tech already exists. One example is Common Infrared Countermeasure (CIRCM). This laser-jammer has the ability to throw incoming missiles off course. Changes such as CIRCM are currently being tested by Sikorsky and Boeing. Israel is seeking to upgrade its heavy-lift helicopters by 2025, and the two companies vying for its contract are Lockheed Martin and Boeing. The major question regarding which to choose revolves around the operational capabilities required by the Israeli air forces. Washington D.C. gives Israel $38 billion in military assistance for the next 10 years to cover the expenses in modernization. Lockheed Martin’s Sikorsky CH-53K King Stallion and Boeing’s Chinook are up for discussion by the Israeli air forces. The King Stallion has 3 engines and a cruising speed of 261 km/h with an 852km range. It includes digital fly-by-wire avionics and fully integrated flight and navigation displays. On the other hand, the Chinook has a cruising speed of 291 km/h and a mission range of only 370km. It incorporates multi-role and multi-mission features alongside a full digital management system in the cockpit. Both Boeing and Lockheed Martin sold aircrafts to Israel before, so it is just a matter of what Israel is looking for regarding upgrades to its heavy-life fleet. Final adjustments to the Chinook include COOLS (Cargo-On/Off-Loading-System), improved gun mounts, vibration control, and seating. COOLS incorporates rollers on the helicopter bed that make for faster movement of equipment and supply pallets. It has an additive advantage in ballistic protection. As the Joint Multi-Role Technology Demonstrator effort predicted, an automated flight system is one of the improvements made to increase the longevity of Chinook. Boeing recently accepted a $276 million Army contract to advance Chinook. Boeing expects “the next-gen Chinooks will have enhanced battlefield agility and this will spur an even greater performance gain in the future.” The Block II Chinook will be delivered in 2023 as the Army plans to upgrade over 500 Chinooks to this new configuration. Sikorsky is known for its advancements in speed, autonomy, and intelligence. Its aircraft can fly up to 250 knots while having lower altitude maneuverability, low downwash capability, high performance, low acoustic signature, and increased mission effectiveness. Sikorsky developed MATRIX technology, which is the autonomy pillar that gives humans the necessary tools and technology to fly missions more often and effectively and improve safety and reliability while reducing the expense of owning aircrafts. Finally, the intelligence advancements are coupled with health and usage operations to improve aircraft safety, economics, and mission effectiveness. 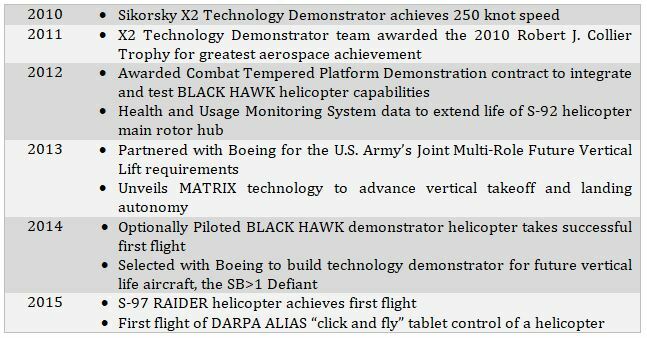 Sikorsky and Boeing are working on the SB>1 Defiant Helicopter with a common design that is faster, has a longer range, and is more maneuverable and quiet. The Defiant will have a top speed of 250 or more knots, or 463 km/hr. That is 160 km/hr faster than the UH-60M Blackhawk transport. Because of the intended improvements in low-speed maneuverability, the Defiant will be more beneficial and effective in urban environments. Sikorsky and Boeing are currently in the process of developing the helicopter as they have been designing it since 2014. This is a proof of concept demonstrator for the army’s acquisition plan to integrate Future Vertical Lift into most aircrafts. The plans for the SB>1 Defiant demonstrate an interest to develop a more unified design for both transport and attack operations. The Defiant’s main competitor is Bell’s V-280 Valor, which is similar in abilities and advancements. This helicopter is part of Future Vertical Lift (FVL), a plan to develop a family of military helicopters that share common hardware, including sensors, avionics, engines, and countermeasures. FVL looks to create new rotorcraft that uses new technology, materials, and designs that are quicker, have further range, better payload, and are more reliable while being easier to maintain and operate, have lower operating costs, and reduced logistical footprints. Sikorsky planned to make flight demonstrations in fall 2017, however it is delayed to 2018. Nothing significant caused the delay, then again the development process is not as quick as anticipated. The team working on Defiant is spending much time in the systems integration lab and propulsion system test bed. The third leg of development is flying the aircraft. This process requires precision and coordination as long as the hardware is constantly refined. The team is pursuing a very thorough risk reduction process that requires more time than previously expected to ensure there are no errors when the aircraft is deployed. This aircraft is the major competitor to Sikorsky-Boeing’s Defiant. Still within the classification of FVL, the Valor has some impressive features that make it a strong contender in U.S. Army contracting. The helicopter has a speed of 280 KTAS (knots true air speed) or 518.56 km/hr. It integrates enhanced situational awareness and sensing technologies as well as a triple redundant fly-by-wire flight control system. Fly-by-wire replaces conventional manual flight controls with an electronic interface. A triple redundant system will minimize the risk of human or machine error. The team at Bell is also seeking out ways to adjust the V-280 Valor to meet the needs of other services. For example, they are developing a “marinized version” for the Marine Corps. Furthermore, some countries, including the Netherlands and Australia, are considering investing in Bell’s FVL research and development. The CH-53K King Stallion includes battlefield and shipboard operations, and is designed to be intelligent, reliable, low maintenance, and survivable in remote and obscure forward operating bases. It is built to the exact standards of the U.S. Marine Corps. The USMC and international militaries can better move troops and equipment from ship to shore, even with higher altitude terrain. It has the ability to carry 463L pallets and high-mobility multipurpose-wheeled vehicles without having to reconfigure or remove troop seating. It has more than triple the external load carrying capacity of other aircrafts, including the CH-53E. Sikorsky suggests this helicopter is best for handling missions such as humanitarian aid, troop transport, casualty evacuation, support of special operations forces, and combat search and rescue. It is built with the upmost security and safety features for most conditions and scenarios. The CH-53K is a general redesign of the CH-53E. Major improvements are made to the engine and cockpit layout. It also offers more lift capacity and space, which is its primary benefit. The ALIAS program (Aircrew Labor In-Cockpit Automation System) created by DARPA (Defense Advanced Research Projects Agency) is a modular plug-in system that drops into any plane. With this system, seven planes can be flown at once instead piloting each one individually. The program leverages autonomy to reduce pilot workloads, augment mission performance, and improve aircraft safety and reliability. There is a tailorable autonomy kit that can be installed in fixed-wing airplanes and helicopters. The challenge at the moment is finding ways in which ALIAS can be incorporated with outdated mechanical controls in fixed wind and rotary aircrafts. With this program, pilots will have the ability to engage autonomy when they want, to help operate, dynamically plan, adjust, and/or execute a complete spectrum of responsibilities. Finally, Sikorsky is developing systems intelligence that gives operators the confidence to fly aircrafts more safely, reliably, and affordably one or even no crew members. The system fits beneath the cabin floor and in the airframe of fixed-wing aircrafts. The system easily connects to the existing mechanical, electrical, and diagnostic systems. Phase 3 of testing is expected to explore intuitive human-machine interface approaching, including using handheld devices, to allow users to interact with and control the ALIAS system more easily. Aurora Flight Sciences, located in Virginia, tested ALIAS with a robotic arm that is part of the co-pilot’s seat. The arm pushes and pulls on the controls and “when it trains its camera on the instrument panel, it can read the dials and readouts like a human pilot.” Sikorsky, which also tests ALIAS, incorporated it with a tablet that connects to the plane’s mechanical controls and is stored beneath the cabin floor. Unlike Aurora, it is more cumbersome to install ALIAS in aircrafts as Sikorsky does. However, Sikorsky compensated for this inconvenience by implementing an additional vision system that monitors the gauges and pilot’s behavior. This setup permits pilots to fly different types of Sikorsky planes, even if they were not trained extensively in them. Over the past several years, the U.S. Army has been undergoing radical improvement plans to its existing fleet of aircrafts. American aerospace manufacturers are competing but also collaborating to bring the best and most advanced technology, automation, and general improvements to the helicopter industry. Over the next several years, phase testing will be undergone until new fleets are released and used on a wide scale. Companies, engineers, and other individuals engaging in these recent changes to the helicopter industry can now take advantage of available R&D federal and state tax credits.